Interactive Dreams: CD-i: 16 bit or 32 bit? CD-i: 16 bit or 32 bit? CD-i is not easy to categorize in the line of game consoles of the past years. At core is it a 16 bit design which sounds like it should be capable of games that were also possible on the Super Nintendo/Famicom or Sega Mega Drive. The fact CD-i was CD-based made it slower compared to cartridge-based systems. But I doubt it could handle the speed of SNES games, simply because the system design of CD-i was not positioned at games in the first place. 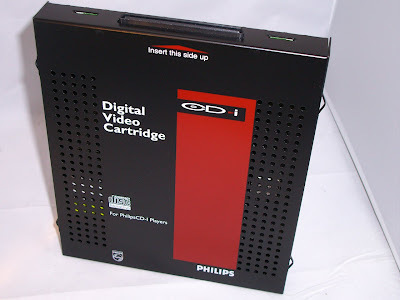 On the other hand: CD-i could be upgraded with a Digital Video Cartridge which was equipped with a 32 bit RISC processor. A few months back we took a look at the Digital Video Cartridge. The acronym RISC stands for reduced instruction set computer, it represents a CPU design strategy emphasizing the insight that simplified instructions that "do less" may still provide for higher performance if this simplicity can be utilized to make instructions execute very quickly. Although it made 3D graphics possible like in Chaos Control, it didn't make CD-i a 32 bit machine. But it's definately more than a 16 bit machine. So what is it? Architecturally, CD-i is no "game machine"